What Did I Do Pre Rubber Stamping? I Used Lots Of Other Media To Create My Artworks. Artworks to me are creative expressions of an individual. I have always enjoyed expressing myself by creating - whether it be visual arts, sculpture, sewing or anything else that interested me at the time. I was very lucky as a child to be encouraged to draw and paint - to make Artworks, and I remember the joy of being praised for my efforts. I am sure that is what gave me the courage to try lots of things and not to be too self conscious about my creative efforts. I thought I would show you a few of my "other" media pieces. 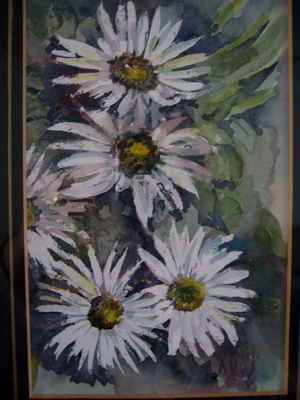 This is one of my early Water Colour paintings. I used a masking fluid on the flowers. It is amazing how many of the rubber stamping terms pop up when using other media in art. I love the colours here and having recently painted the family room an Olive greeny colour, this painting looks quite nice against that wall. I think water colour painting has a big influence on my rubber stamping, as I particularly like using water colour paper and the marker pens or water crayons with card making. I find a natural extension to painting with water colours is Silk Painting. That has to be one of the most relaxing past-times I have ever experienced! I used to love drawing free hand with the gutta, and I usually ended up with either flowers or fairies. It was a wonderful way to release frustrations of daily living, as the flow of the ink over the silk was just so soothing. One day this creation happened. It is quite a large piece - about 1000 x 600 mm, and is hanging in an alcove near one of our bathrooms, so I could not get a photo of the full piece. The colours are so vibrant and whimsical and with practice you can get them to blend quite well too. Can you see the elves and goblin faces in the design? They pop up everywhere. I think I must have been "off with the fairies" that day! 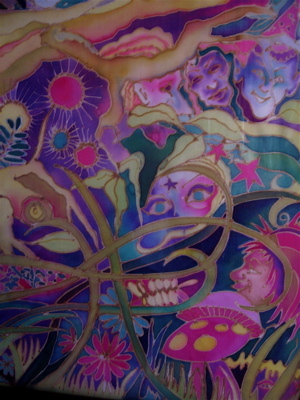 Here is a detail section of the Artwork. You can see lots of little faces appearing amongst the branches- eyes looking out at you from every angle. Sometimes I have used lines just for the sake of using lines. The design demanded that a colour change occur, and with Silk Painting you have to provide a block (gutta line) to stop the flow of the ink. It was so much fun making this - I used gold gutta outlines. 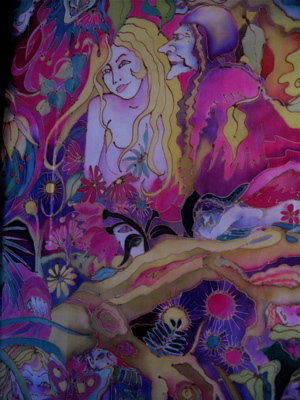 Here is another silk painting. 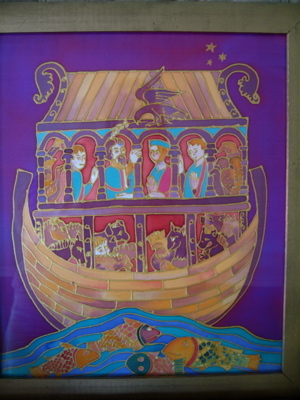 My inspiration was a Medieval Noah's Ark. I find so many ideas by looking at past Art styles throughout history. If you simplify them and change the colours you can create an up-to-date Artwork that will fit in your home decor. Again, you will see the luminosity of the ink colours and the almost flat 2-D effect gained by treating the image graphically rather than realistically. The combination of views - an aerial view of the fish, and a front on view of the ark help to remove any concept of a realistic impression. I also enjoy doing 3-D projects. I find 3-D objects very exciting in paper crafting and I used to love building with clay. Some of the sculptural items I still have in the garden are pictured here. They are constructed using a grainy Clay - I love the texture of this clay and although the pots were fired in a conventional kiln, I still enjoy the tactile surfaces that each of the pots has. 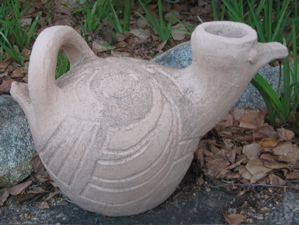 The bird pot was inspired by South American sculpture. I built it using thick coils that were smoothed over and then a design was carved back into the clay. 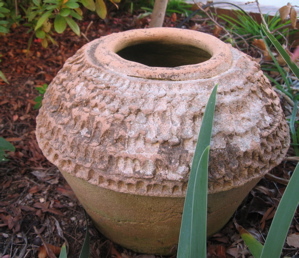 It has been left without glaze, and over the years has started to discolour from the plant life around it. The other pot is made from a combination of slabs in a mold and large coils that were pinched together. Again it was not glazed and is taking up some of the natural colours around it. If you enjoy creating with lots of different media, and you wish to find information on selling your craft, you may like to browse this site.